It was a cool California November afternoon in 1947 when the HK-4 Hercules, also known as the Spruce Goose, finally flew. It was supposed to be a simple taxi test, nothing more than motoring through the water of Long Beach Harbor to show off its speed and test out the plane in open water. But having endured years of people mocking the project and himself for trying to build a plane so massive it had no hope of flying, Howard Hughes decided to take the opportunity to extend his middle finger at them all in the most poignant way he could. No doubt with a twinkle in his eye as the Hercules cruised through the water, Hughes turned to the 30 year old hydraulic engineer, David Grant, who he had chosen as his co-pilot that day despite him not actually being a pilot, and unexpectedly told him to “lower the flaps to 15 degrees”- the take off position. Not long after, the massive, few hundred thousand pound (250K lb / 113K kg empty, 400K lb / 181K kg gross), 218 ft (67 m) long aircraft with a still record holding wingspan of just shy of 321 feet (98 m) was out of the water. It was airborne for under a minute, went less than a mile, and only about 70 feet in the air, but it had done the impossible- the Spruce Goose flew. As to why Hughes didn’t fly it further, besides elements of the aircraft still needing tweaked and the potential danger of taking media aboard a test flight in which even the pilot wasn’t quite sure how the plane would handle, they’d been taxiing around for some time at this point and the plane hadn’t been fueled much to begin with. As such, Hughes didn’t want to risk running out of fuel in open ocean before he’d have a chance to circle back around and land. Now, the original plan for this aircraft was a lot more grandiose than a brief publicity flight. In 1942, the United States – along with much of the rest of the world – was in the midst of WWII. Being across an ocean from where the fighting was taking place was a problem when transporting supplies, weapons, and soldiers en masse. At the time, efforts on this front weren’t going well. German U-boats were patrolling Atlantic waters and torpedoing anything that was perceived to be helping the Allied war effort. According to one estimate, between January 1942 and August 1942 alone, German U-boats had sunk 233 ships and killed more than 5,000 Americans. It was clear that a better way was needed for transporting things safely across the Big Blue. It was Henry J. Kaiser who first proposed an idea of an airboat. Running one of the most important construction companies in modern American history, Kaiser was responsible for building quite a lot of the infrastructure of the American west at the time (including the Hoover Dam). He also created a system for fast, high-quality shipbuilding during World War II that became world renownd. Kaiser thought that a massive airboat packed to the gills with supplies and troops that could fly over German U-boats was the answer to the problem. However, he was a shipbuilder and not an expert on airplanes… But he knew someone who was. By 1942, Hughes was already a famed figure in America. Exceedingly wealthy, he first gained widespread fame as a Hollywood producer who was most prominently known for producing and directing Hell’s Angels, a World War I epic about aerial combat that was (at the time) the most expensive movie ever made. In 1934, he formed the Hughes Aircraft Company. A year later, he helped design and build the H-1, or as he liked to call it, the “Racer.” In September 1935, he broke the world land speed record in it with an average of 352.322 mph. In sort of a precursor of the future, during the flight the plane ran out of gas – something Hughes didn’t anticipate – forcing him to crash in a beet field, narrowly avoiding serious injury. He broke another land speed record when he flew to New York from Los Angeles in a mere 7 hours, 28 minutes, and 25 seconds (averaging 332 mph). In 1938, he shattered the world record for quickest time flying around the globe, needing just 3 days, 19 hours, 14 minutes, and 10 seconds, almost 4 days quicker than the previous world record set in 1933 by Wiley Post. His prowess as an aviation engineer and pilot quickly earned him a reputation as one of the most innovative aviators in the world- someone that Kaiser thought would help the Allies win the war. For months, the old-school industrialist and the new-age aviator worked together to put together plans that would wow. In late August, they submitted to the government blueprints for a seaplane with eight engines, a wingspan longer than a football field, and a hull taller than a five-story building. Beyond being the largest plane ever built by far at the time, it would be able to transport 750 troops or two M2 Sherman tanks. It had a gross weight of about two hundred tons, which was nearly three times heavier than any other airplane ever built. And, due to wartime metal restrictions, it was to be built nearly entirely of wood. Hughes and Kaiser called it the HK-1, naturally named after themselves. While hesitant at first, the federal government gave the pair $18 million (about $250 million today) to develop and build a prototype. It didn’t go well from the very beginning. The Hughes Aircraft Company was not a big company in 1942 and struggled with staffing, expenses, and deadlines. Hughes himself was unfocused, taking on too many projects while underestimating how much attention was needed to build a plane that would eclipse anything anyone had ever attempted to make fly. Four months in and the best thing that could be said was that they built a 750-foot long hanger, also made out of wood. By mid-1943, construction had begun on the plane itself, but it was incredibly slow-moving. Working with wood proved to be an enormous issue, presenting a variety of challenges that had to be overcome to make a reliable sea-plane. Beyond the aforementioned then innovative hydraulic system for manipulating the control surfaces, each piece of wood (which was mostly birch, not spruce, owing to birch being quite resistant to dry rot) had to be weighed and analyzed for quality assurance before being used. In addition, each sheet had to be laminated with a waterproof glue in order to prevent it from being damaged by water, heat, and fungus. Along the way, besides needing to purchase the rights to the Duramold laminating process, which in a nutshell involved stacking shapable ultra-thin strips of wood and applying a glue, Hughes and his teem also had to develop a variation of the process for their particular application. As late 1943 approached, the first prototype was due to the government but it was clear that wasn’t going to happen. What’s more, they had spent nearly half of the budget on “engineering re-tooling” and rumors were swirling that the first plane wasn’t going to be done until 1945. It turned out to be much worse than that. At this point, Kaiser had had enough and bailed out of the project. Several times, the feds threatened to shut the whole thing down, willing to cut their losses. The contract that had originally been given to Hughes and Kaiser went from 500 planes to 3 planes to, finally, just one for the original $18 million. By 1944, $13 million of that money was spent and, yet, the plane was less than half done. Then the war ended and any hope that the now-called H-4 Hercules (renamed after Kaiser left the project) was ever going to help the war effort was gone. The Hercules was a monumental undertaking. It is the largest aircraft ever built. It is over five stories tall with a wingspan longer than a football field. That’s more than a city block. Now, I put the sweat of my life into this thing. I have my reputation all rolled up in it and I have stated several times that if it’s a failure, I’ll probably leave this country and never come back. And I mean it. And so it was that he paid for the project’s completion himself. The H-4 Hercules was finally finished in June of 1946 with $22 million of the government’s money and, while figures vary from otherwise reputable sources, according to Boeing, $18 million of Hughes own personal wealth chipped in, for a grand total of $40 million (about $450 million today). It should also be noted here that, subtracting initial research and development costs, had they decided to build a second plane, it probably would have only cost about $2.5 million (about $28 million today). It took a little over a year more for Hughes to it fly. 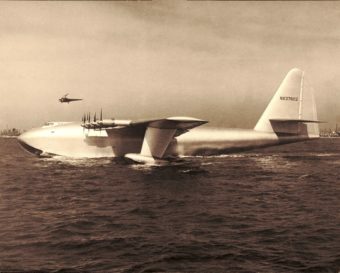 At this point given the massive scale of the plane, the incredible weight, the fact that it was made of wood, and the perpetual delays, the media had taken to mocking the plane, calling it the Spruce Goose – a nickname that Hughes and his team hated owing to it demeaning what was otherwise a marvel of engineering. But on that fateful November day, the Hercules finally did what it was intended, proving many a critic wrong. In the aftermath, there was some wrangling over who actually owned the plane given how much money Hughes himself had sunk into the project. But the U.S. government eventually gave up its rights to it in exchange for the Smithsonian Institute’s National Air and Space Museum getting the Hughes’ H-1 Racer plane and a portion of the Spruce Goose’s wing, as well as in exchange for a relatively small payment of $700,000 (about $3 million today). For years afterward, Hughes, now moving on to other projects, kept the plane in the hanger he built specifically for it, seemingly originally with the intent of eventually flying it again. In fact, he kept a full-time crew of, at its peak, hundreds of people on hand to make sure the plane was ready to fly at any given moment, costing him millions of dollars over the years to do that. Howard Hughes died in 1976 and the Spruce Goose immediately was under threat of being dismantled owing to the cost of maintaining it in its massive hanger. But the Aero Club of Southern California acquired the legendary plane in 1980 and put it in their own hanger next to the Queen Mary in Long Beach, right near where the plane did its maiden and final voyage. The Walt Disney Company bought the property in 1988 and, after a few tense years, given Disney wanted the plane gone, the Evergreen Aviation Museum in McMinnville, Oregon won the right to acquire the Spruce Goose. For the last 26 years, that’s where it has remained, meticulously maintained. In fact, it’s generally thought that the maintenance over the years has been so good that, with some upgrades, particularly to the wiring and electronic components as well as going through the engines, it could possibly fly just fine today. Of course, because of its historical significance, nobody has seriously suggested anyone make those upgrades and try. What Happened to Howard Hughes Money When He Died? I first saw “The Goose” in Long Beach in 1988 when traveling to Pomona to the Winter Nationals. I loved it then, and love it now. As the Evergreen Museum is close to my home, I get to visit occasionally, always a treat. If you have a change to go see the Museum, do yourself a favor, do it. Take the Grand-kids as well.